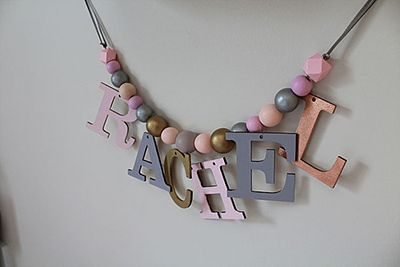 When my client first got in touch, it was to do an urgent e-design for her little girl’s transition to a big girl bedroom. At that stage, Mom was confident she could do the installation herself but that quickly changed. 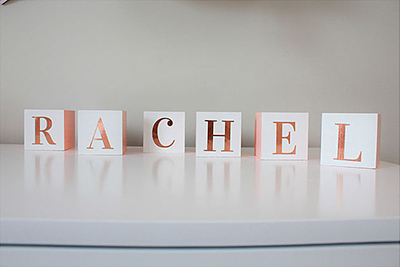 Heavily pregnant and in a bit of a panic to get little Rachel settled in her new space before the imminent arrival of her baby sister, we had a 2 week turnaround time to get everything done! 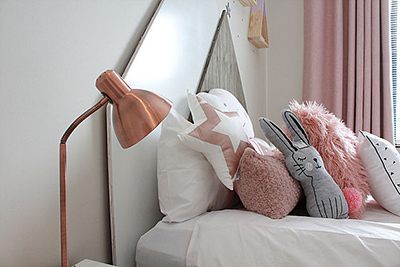 Mom was keen on a Scandi look and feel, incorporating the trendy palette of Blush, Grey and Rose Gold, which is what led us to the popular House Headboard and the clean lines of the scandi base. Concerned about the existing variations of timber in the room, we opted for a solid white panel combined together with a natural stained pine panel, giving a stunning contrast between duco and timber. 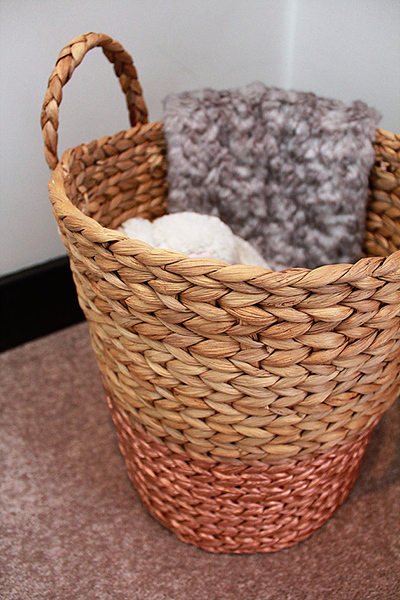 Adding an array of quirky, gorgeous scatters in various textures, completed the look! 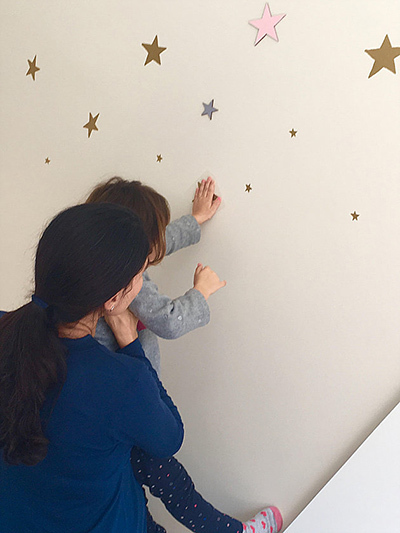 The bed was set off by a stunning whimsical feature wall sprinkled with gold and blush stars, and a super special moment was created when we got Rachel to choose her very own star and Mom helped her find the perfect spot for it. 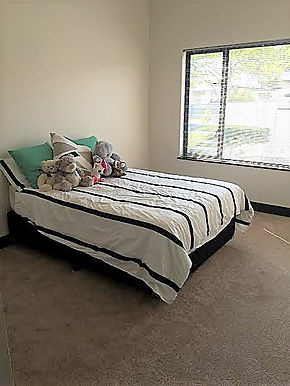 It’s the little things like this that encourage a happy and exciting transition from safe baby sanctuary to potentially-daunting big girl room. On to the curtains… Mom was hesitant at first when I suggested the beautiful Rose Quartz fabric, but reservations were soon put to rest when she saw the end result! Soft and oh-so-pretty, they are the perfect combination of feminine chic. 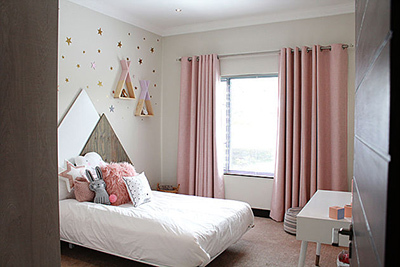 Eyelets are one of my favourite curtain headers for kids spaces – neat, simple and contemporary. We designed the matching Scandi dresser/desk and bedside table for longevity. For now, the desk will serve as a dresser when Mom adds a mirror, and as Rachel gets older and needs a space for homework/studies, it will happily offer that function as well. 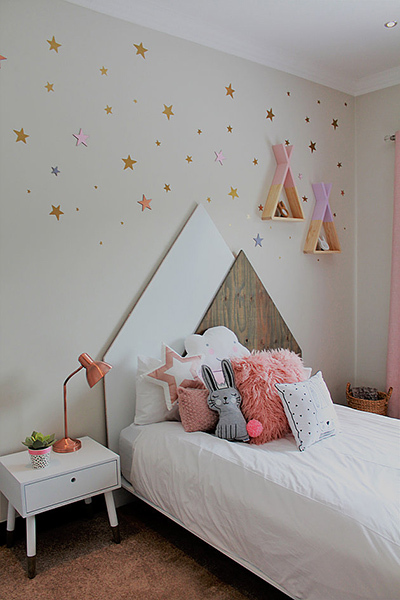 Accessories were added in the form of a rose gold lamp, a personalised timber name garland, some quirky decor pieces and the most exquisite twinkling fairy lights surrounding the headboard…oh to be a little princess! 2. 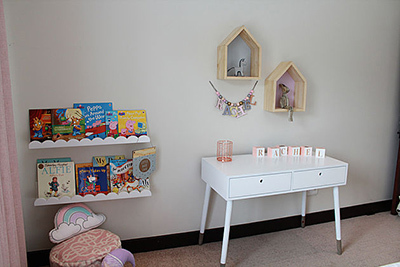 Create a space that’s magical to little eyes, whilst being functional and fun… a place that is so welcoming your little one doesn’t want to leave! 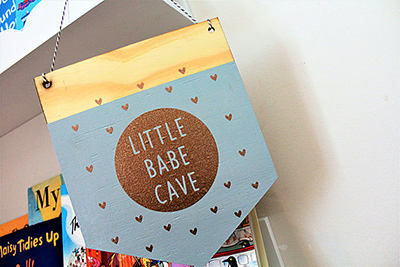 This means introducing areas that are specific to your little one’s personality and taste. 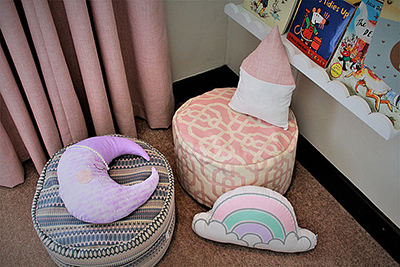 If she loves to read, create a cozy reading nook with fairy lights and a little wall library; if he adores building lego or drawing, create a little lego corner with a table & stool, or low-level play/art table with a comfy floor cushion. 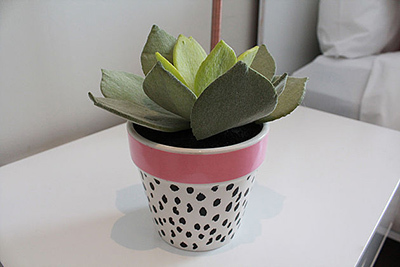 There are so many trendy options out there, long gone are the days of ‘kitsch’ plastic and primary colours! 3. One of the biggest fears with little ones is the dreaded DARK, and moving out of the safe confinement of a cot into a huge open bed often adds to that fear. 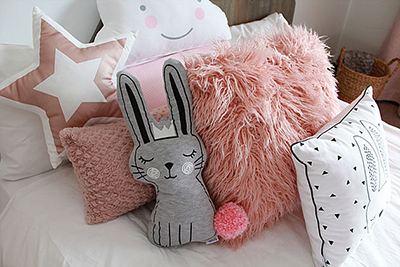 Thankfully, there’s so much you can do to help diminish it…consider adding a string of fairy lights around her bed, a cute nightlight on the bedside table; glow-in-the-dark stars on the ceiling, or a trendy batman wall mounted lamp. 4. Choose a palette that will provide longevity; steer away from dominant wall colours, and instead introduce an accent colour/s in the form of soft furnishings and accessories – things that are easily changed down the line. 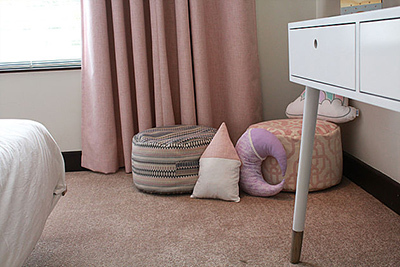 If you need our help with your little ones’ transition, whether it’s for a complete room makeover or just advice on potential changes you can make to adapt their exiting room to suit their growing needs, drop us a line at caitsroom@gmail.com.